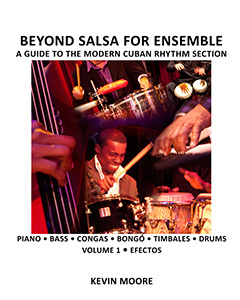 The Beyond Salsa for Ensemble series is designed to teach modern Cuban rhythm section techniques to college and high school bands, and working professional bands. Each volume contains extensive exercises that systemically teach each of timba's many rhythmic and formal innovations and each contains a full chart of an important timba hit, ready to play at concerts and gigs. The most frequent question I've heard people ask about Cuban music is: "What's the difference between timba and salsa?" There are many answers to this question, most of them having to do with many having to do lyrics, dancing, melody and chord progressions, but if we limit ourselves strictly to the percussion instruments and the rhythms played by the bass and piano, there are still many key differences and that's what these books are about. VOLUME 1-PART 1: THE BASIC GROOVE Salsa and timba share the same basic family of grooves, tempos and dance styles, but timba has a distinctly different attitude and flavor and this difference can be broken broken very easily from a technical musical point of view. Many of the same instruments are used: congas, two interlocking bells, timbales and bongó, but timba adds kick drum and sometimes snare, toms and hihat. Salsa almost always uses three percussionists: timbalero, conguero and bongosero. Timba uses these three instruments, but has many ways of dividing their responsibilities among two, three, four or even five percussionists, and many very different ways of approaching the grooves that the instruments play, with the most dramatic differences between in the piano, bass, congas, and of course, the drumset elements. In Volume 1 - Part 1, we learn a typical timba groove, and compare it to the same chord progression played with a salsa groove. All the parts, for all six instruments, are written out note-for-note and have 12 different audio files - fast and slow, with each instrument panned hard left. For example, the timba groove above happens to be the normal speed bass version. There are 11 others, with different speeds and featured instruments. This way, you use your balance or pan control to solo or mute your own instrument when you play along. VOLUME 1-PART 2: EFECTOS Efectos (sometimes called bloques) are those fantastic funky breaks that timberos intersperse into the fabric of their grooves. We include 36 of these - 18 different basic ideas, each in 2-3 and 3-2 clave (the 3-2 groove has different basic piano, bass and congas parts). Here's an example of Efecto 12 in 2-3, at full speed, with the congas as the featured instrument. Efectos can be rehearsed as a standard part of an arrangement, or can be learned as special modules, like sports plays, that can be called with hand signals or musical signals. VOLUME 1-PART 3: Performance Chart The featured song for Volume 1 is El buenagente by Pupy Pedroso y Los Que Son Son. It includes piano and bass parts written out note-for-note, all the way through - in both 8th note and 16th note version - and also a lead sheet version with chord symbols and slashes. There are also basic percussion grooves, full horn parts, and all coro vocals, written out in 3-part harmony, with fast and slow audio files to help you train your coro singers. All of the lead vocal lyrics, including the guías, are included as well. VOLUME 2-PART 1: GEARS In Volume 1, we deal with the main, bread and butter groove used behind coros in the montuno section. In Volume 2, we learn seven other gears, or alternate grooves that are used on the cuerpo (or verse), the breakdowns, the bombas, the mambos, and so on. VOLUME 2-PART 2: SWITCHING GEARS Like efectos, switches between these gears can be written into the arrangement or cued with hand signals. VOLUME 2-PART 3: Performance Chart The chart for Volume 3 hasn't been chosen yet. Stay tuned! And look for a course in Beyond Salsa Ensemble at an educational institution near you.